This simple prayer is powerful beyond words. I have often had to recite it – out loud or in silence – when I’m tempted to resist change, fix what’s beyond my control, or slip into helpless resignation. Once again, the birds are my teachers, reminding me that acceptance is the key to my serenity. I was bitten by the bird watching bug during Florida’s breeding season. 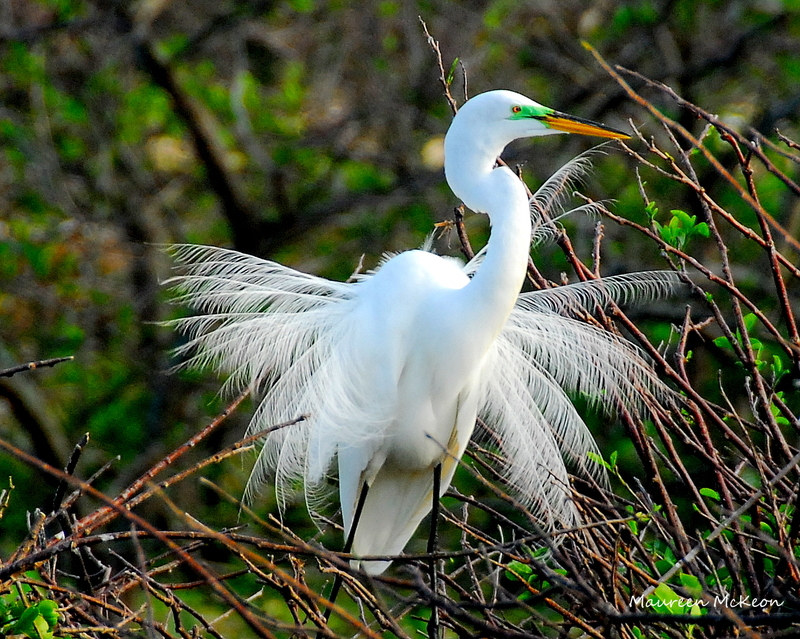 Watching the active birds during winter and spring months is delightful – the gorgeous display of breeding plumage, earnest nest-making, mothers sitting patiently on tiny eggs, and finally…the hatchlings popping their teeny heads out of the nests! 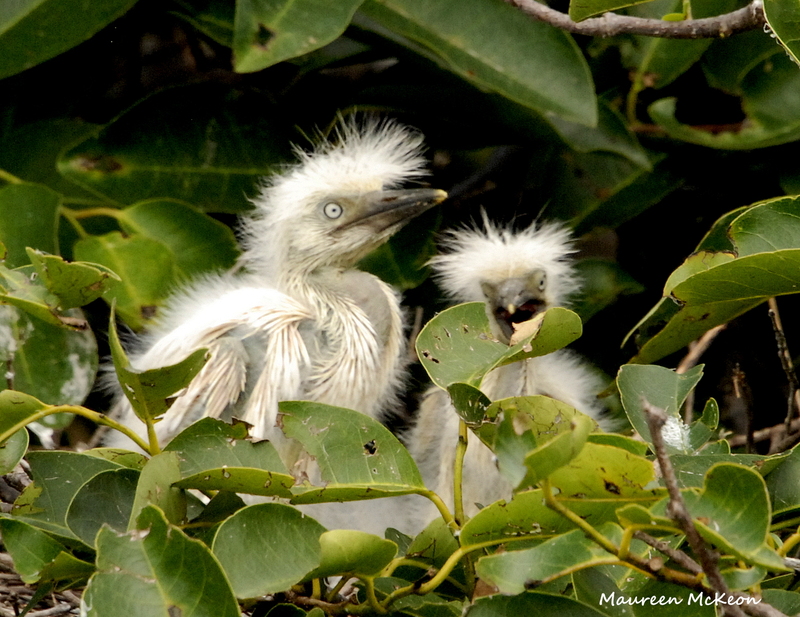 Every weekend, I couldn’t wait to get back to the wetlands to check on the “babies” as they grew into fuzzy nestlings (like the two hungry cattle egrets pictured below). 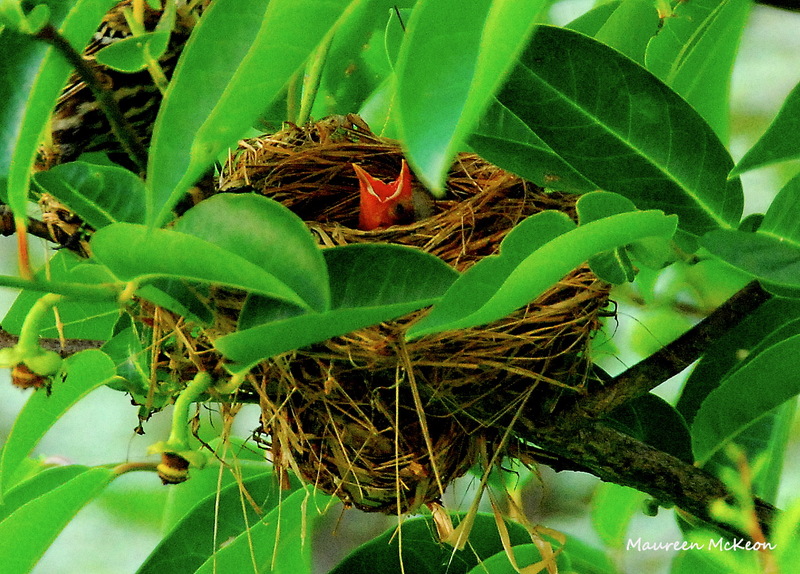 By now, many of these baby birds are fledglings, trying out their new wings and venturing out of their nests and into the world. But sadly, the circle of life includes death. What I think is tragic is often another creature’s meal – and means of survival. “It’s the circle of life!” my birding and wildlife photographer friends assure me when an alligator lunges for a moorhen or a turtle snaps up a tiny chick. “Yes, but I don’t like this part of nature,” I whine. 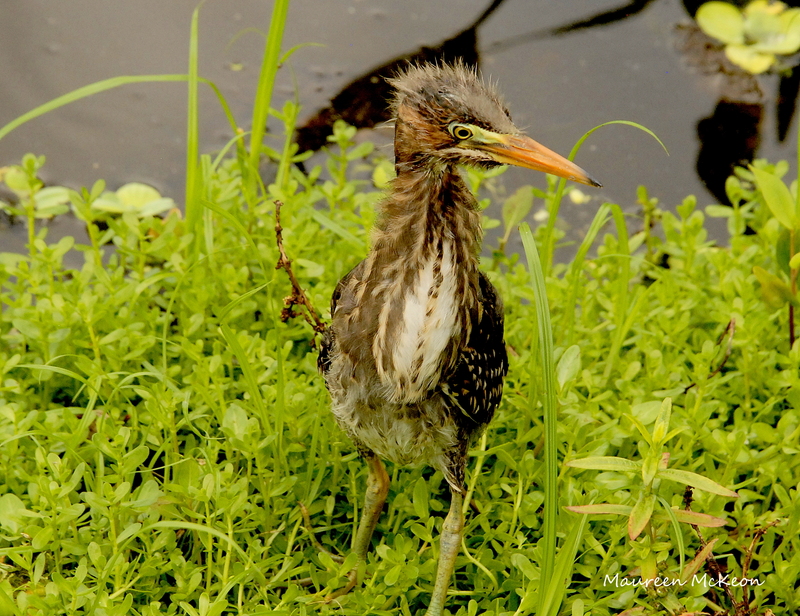 Green Heron chick, the sole survivor. Take the green heron chick in the photo above. Cute, right? I was excited to spot him last week, but my happiness quickly turned to sadness when I learned that two other sibling chicks had been stolen from the nest by an alligator. This little guy was the sole survivor. 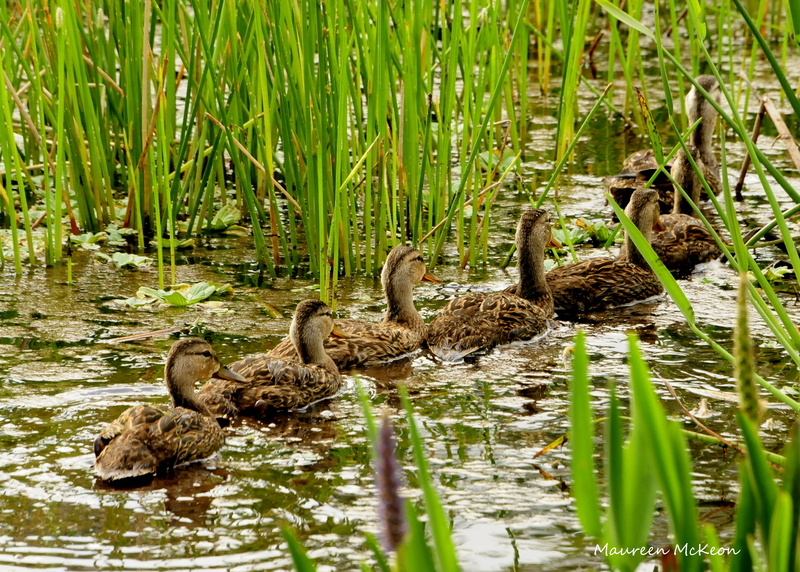 And remember the mother duck and nine little ducklings that appeared in my Mother’s Day post? At last count, we were down to six. I have no idea what happened to the other three ducklings, but I imagine they ended up on some bigger critter’s menu. Here’s one more example: A tiny red-winged blackbird in the nest one week, and gone a week later. I felt a pang when I saw the abandoned nest (knowing he didn’t fly away! ), but then I remembered the whole “that’s nature – the circle of life” spiel, accepted the situation, and moved on. So do the birds suffer when they lose one of their chicks? Maybe they grieve a little, but I’m pretty sure they get over it quickly and get back to doing what birds do. Acceptance is not the same as resignation, but they’re easily confused. When I accept something I cannot change, I allow myself to feel the emotion, but embrace the situation with the understanding that it is exactly as it should be. And no, it’s not always easy -in fact, it rarely is! It takes a strong faith muscle to trust that there is a higher purpose at work. Nothing happens in God’s world by mistake. If a situation leaves you frustrated, resentful, or feeling victimized, you’re probably in resignation mode. This is not the path to happiness. Resignation takes away all your power -the will and courage to change what you can. Pray for acceptance and feel the comfort of grace. More words of wisdom from a great photographer !!!! Thanks, Ralph – it takes one to know one! Thanks, Charlotte – glad you enjoyed it. Wishing you a day of serenity!